15 February 2016 Europe’s steel industry has sent out a clear message today during a demonstration in Brussels, stating its concerns regarding the discussion on granting China market economy status (MES). 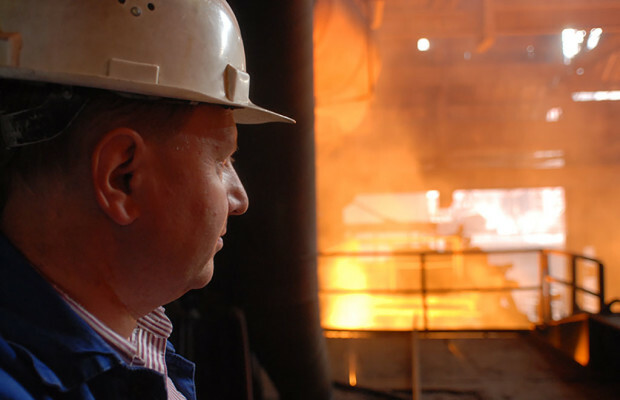 The demonstration was organised by EUROFER, the European Steel Association. Several national affiliates of industriAll Europe joined the call for mobilisation. IndustriAll Europe supports the principle of competition through free and fair trade and therefore rejects the idea of granting MES to China, for that moment of time as several WTO criteria remain unfulfilled. As of today, China remains a state-run economy that exports to Europe’s open market its overcapacity, at destructive prices below the real production costs, in an effort purely aimed at gaining market share as well as undermining and eliminating competition. “Anything but a rejection of China’s application for MES at the moment would seriously harm internationally agreed norms”, said industriAll Europe Deputy General Secretary, Bart Samyn. “If we grant MES to a country like China, that undercuts standards at home and prices in its export markets, we will see considerable damage done to the European labour market and continued harm to the global climate and environment”, he concluded. Instead of considering opening the door to underpriced and cheap Chinese imports and giving up the possibility to put in place anti-dumping measures against such products, the EU needs to swiftly establish more robust trade defence mechanisms. The focus must be on safeguarding industrial jobs in Europe and promoting international environmental legislation worldwide. Therefore, serious negotiations of WTO and EU Commission on the conditions of China’s MES are needed. However, against a background of global disruption of the steel market and of manifest crisis in the steel industry, measures targeting Chinese exports are not sufficient. Many Member States have already intervened to support their steel industry, recognising its strategic importance for the entire economy. Nonetheless, in view of the scale of the steel crisis that has lingered since autumn 2015, these measures appear inadequate and fragmented. An answer must be found at EU level. Tools such as the EU Emissions Trading System (ETS) need to be fine-tuned in such a way that they reward and encourage local and sustainable producers, without placing additional burdens on them, and they adequately price in all externalities found in imports, in particular those coming from China. Temporary measures to retain steelworkers and their know-how need to be put in place, and production capacities need to be preserved in the event of declining economic conditions. It is necessary to maximise the use of European, national and regional funds to help workers affected by the consequences of this crisis by making sure that the steel sector has the same access as other sectors to funds at all levels. Moreover, emergency safeguard measures in accordance with WTO rules, such as the introduction of a price floor and addressing the investment needs of the sector, need to be adopted. Steel clearly remains the most important industrial material in the world. If the EU is serious about rebuilding its economy and launching it along a path towards a sustainable industrial renaissance, it cannot do so without steel, therefore MES must not be granted to China.